• Commission Notice on best practices (2011). See Chart C33 et seq. • The general legal basis provisions of Arts. 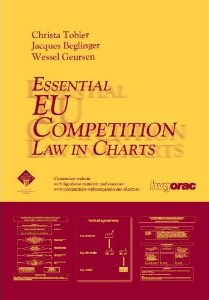 114 and 115 TFEU: for other issues (e.g. Merger Regulation 139/2004/EC). • For EU competition law to apply, the conduct in question must have a (potential) effect on trade between Member States (so-called “inter-state” or “internal market element”; see Chart C7, Chart C29, Chart C49). • EU competition law and free movement law can apply simultaneously; e.g. Essent Netwerk (2008), Presidente del Consiglio (2009), Murphy (2011).